This year was my first spent outside of the country on the 4th of July. Yet despite being far from home, this year proved to be the single most meaningful Independence Day of my life, as I spent the day in a refugee camp in Bethlehem with some of the most incredible young guys I have ever met – the artists from the hip-hop group Palestine Street. Because the organization that I work with focuses on community based organizations, and hip-hop has quickly become the voice of the youth in the neighborhoods of Palestine, this was our first step at working toward such collaboration. The drive to Bethlehem is short from the center of Jerusalem. The line at the checkpoint probably takes about as long as the drive south through the city, through the tunnels and winding roads that snake through small towns, and past houses that have probably existed on the land for longer than people may have written records of. When you arrive at the very large gate at the edge of the city, a guard tower looms overhead. The words “Jerusalem-Bethlechem – Love and Peace” are painted on the walls 50 feet to the right. Humanitarian Aid and NGO vehicles line the streets. As you drive closer to the gate, a looming sign greets you – “Passengers Must Dismount for Inspection” is written in Hebrew, Arabic, and English. The sign is worn and beaten up. The irony sits heavy if you can find space in your mind to stop and think about everything that is happening around you. What a greeting to the next stop in the holy land…. After a short trip through the city, we met up with Mohamad, one of the members of the hip-hop group who offered to give us a tour through the city that day before discussing potential collaboration with Grassroots Jerusalem. I could go on and on about the rest of the afternoon. The sights, sounds and smells of Bethlehem were many. The small streets of the refugee camps barely allowed for cars to pass each other going in opposite directions. Stories of the number of medical clinics relative to the number of residents in the neighborhoods were staggering (and not in a good way). 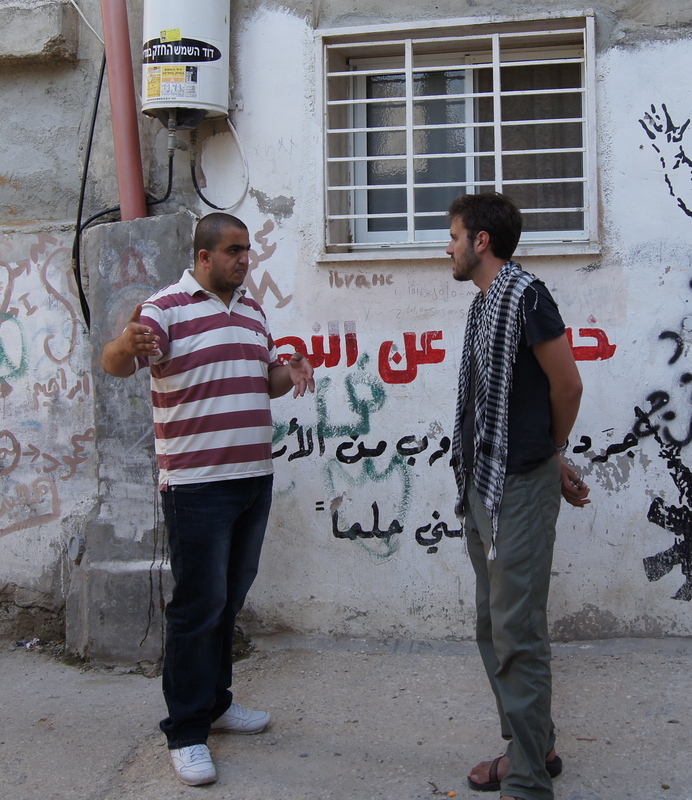 The graffiti throughout the city painted the portrait of struggle – some of hope and peace, some of violence and anger. All felt entirely justified. 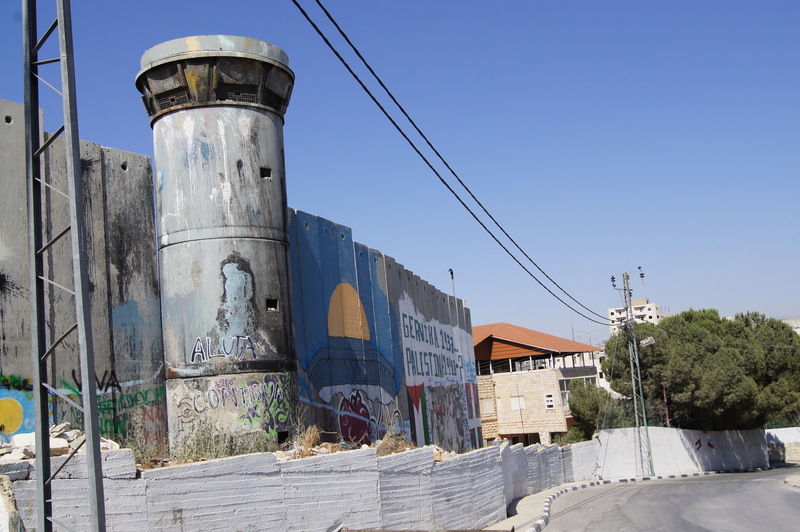 Many of the streets had no names, except for the ones that were spray painted on the intersections by Israeli soldiers during the first Intifada so that they could reference specific intersections and warn each other against territories that were more difficult to navigate than others. Memorials symbolizing struggles of the past relayed the heart and perseverance of the inhabitants of the city. There was no shortage of vibrant life here. As we walked through the winding streets, I asked if there was a place we could go that would give us an overhead view of the Dheisheh camp, which was main neighborhood that we spent time in that afternoon. As we climbed up a hill and onto the top of the broken structure of a building, Mohamad walked to edge with a smile on his face. Despite all of the sad things had told me about this place, all of the friends he had lost in the fighting or due to a lack of proper medical attention, or the mental and psychological impact that the place has on those living there – he turned to me with a smile on his face. “Look at this place," he said. "It’s a dump, but I love this place. This is our home.” I find myself not saying much here. Sometimes it’s the language barrier, but more often it’s just the amount of processing that you have to do on a daily basis. All I could do in that moment was smile in awe of his perseverance, and continue to take in all that I had learned over the past couple of hours. The sun was just beginning to get low in the sky, and the light was reflecting off of the houses in a way that created a silver outline across the rooftops. And on the roof of the building that they first came to hide out in and learn to write and perform hip-hop years ago as young teenagers, the guys gave me a taste of some of their music. Beatboxing and rhyming in Arabic, I did not understand their words. But the passion behind their voices, the stories of why they began using hip-hop as a form of person al expression, and the trail of kids that followed them through the streets everywhere that we went provided me with all the information that I needed. This was the music of the revolution for them. This was their outlet. They were songs of rebellion, freedom and hope. And as they performed for us with the refugee camp in the background, walls drawing lines across the land in the distance, and five kids under the age of 13 listening and rhyming along with the lyrics of their songs in unison - they were my fireworks that day. Their company was more than I could ever ask for on the 4th of July, thinking about the meaning of liberty, freedom, and independence. As we got back into the car a couple of hours later to head back to Jerusalem, we pulled back through the looming checkpoint and past the sign that said “Jerusalem-Bethlechem – Love and Peace.” Melodies of Christian Hymns floated through my mind. Not being religious, I didn’t really know most of the words, so I stayed up past the 3:30AM call to prayer that night flipping through photos from the day and reading Christian songs like these. Sometimes I wonder if just visiting places like this is all that we would need as a society to stop such disrespect for human life, and to instead follow the words written by those told of in the tales of the books that we as a human race follow so closely. These books and songs tell of peace, love and unity. Yet in this holy land, it is anything but that.